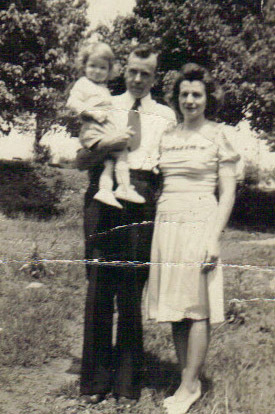 James David Puckett was born May 16, 1909, in Meadows of Dan, Virginia, the youngest of six children. He moved to Fieldale in the mid 1930�s, living at the Virginia Home and the Sycamore Inn while working at the Fieldcrest Mills as a maintenance foreman making $9.00 a week. David loved the outdoors and could identify every plant and tree in the forest. He loved to hunt and harvest ginseng in the mountains. He was an avid hunter and fisherman. The first day of trout season, David could be found wading in the South Mayo Creek near Stuart, Virginia. He always managed to catch the legal limit. Gardening was another of David�s passions. He had several vegetable gardens along the bottoms of Smith River. He seemed to have a green thumb and the growing went well. At times he would supply vegetables to the local grocery store and also sold some of his harvest at his fruit stand in Patrick Springs. His mountain heritage led him to favor bluegrass music that he played on his fiddle. Also due to his heritage, David was a good narrator of mountain folklore, including witchcraft and ghost stories of the Meadows of Dan region. David was a WWII veteran. After the war, David worked for the U.S. Customs in Norfolk, Virginia, and then returned to Fieldale in the mid 1940�s. He owned and operated the Fieldale Cab Company for 10 years, working the day shift hours and then working the night shift at Appalachian Power Company as a PBX operator, retiring after 25 years. David married Ethel Trent in June of 1939. Nanie Ethel Trent was born October 8, 1912, in Critz, Virginia, the daughter of Walter Cole Trent and Jennie Reynolds Witt Trent, a descendent of R.J. Reynolds. Walter was county surveyor for Patrick County and his brother John Abe Trent was county surveyor for Henry County. Ethel was the oldest of five children, two sisters, May Trent Gusler and Margaret Trent Bracy, and two brothers, Billy Trent and James Trent. James Trent was a POW for 39 months and was a survivor of the Battan Death March, weighing only 98 pounds when liberated. Ethel worked for the Fieldcrest Mills as an order clerk, retiring after 40 years. Ethel and David rented a house from Fieldcrest Mills at 37 10th Street, later purchasing it. Their son, Larry David was born there, August 28, 1940. In 1950, they moved to 28� 10th Street and in 1965 purchased a residence at 10 Patrick Avenue, Fieldale, Virginia. Ethel and David were members of the Fieldale Baptist Church and Ethel participated in the various women�s groups when possible. She never learned to drive and with David working the night shift, she was limited in her ability to travel. Ethel loved to cook and bake, especially cakes and pies. Pound cake, Coconut cake and Chocolate layer cake were her favorites. Her favorite pies were Apple, Peach and Pecan. She also did beautiful needlepoint and quilts. Several large framed floral needlepoints and 4 needlepoint-covered chairs are on display in my (Larry) home. Also several quilts are still in use today. One of Ethel�s favorite memories was being able to travel with friends to Greensboro, NC, to see Lawrence Welk in concert. Music was a love of hers. She played the piano and her favorite piece to play was Stardust. Ethel was diagnosed with cancer in the early 1980�s and succumbed to that disease May 23, 1990, at the age of 77. David lived alone for approximately 4 years at his home on Patrick Avenue. He became ill and was unable to remain at home, so he became a resident of Blue Ridge Nursing Home. He lived there for 5 years and passed away in 1999 at the age of 90. Their son Larry and his wife Darlene reside today in St. Clairsville, Ohio.